A new group of roughly 300 Marines has arrived in Norway for a planned six-month rotation. The Marines are with 2nd Battalion, 2nd Marines, based at Camp Lejeune, North Carolina, said Lt. Jacky Chow, a spokesman for Marine Rotational Force-Europe. The first rotation of Marines left Norway at the end of August and has returned to Camp Lejeune, Chow said on Wednesday. The Marines’ time in Norway included cold weather training in Porsangmoen, which is less than 200 miles away from Russia. The Norwegian government has approved six-month rotations of about 300 Marines in Norway through 2018. The Marines also store military equipment in caves near Trondheim, Norway, to make sure that a Marine Air-Ground Task Force has what it needs for cold weather training, crisis response or a humanitarian assistance mission, said 2nd Lt. Brett Lazaroff, a spokesman for U.S. Marine Corps Forces Europe & Africa. 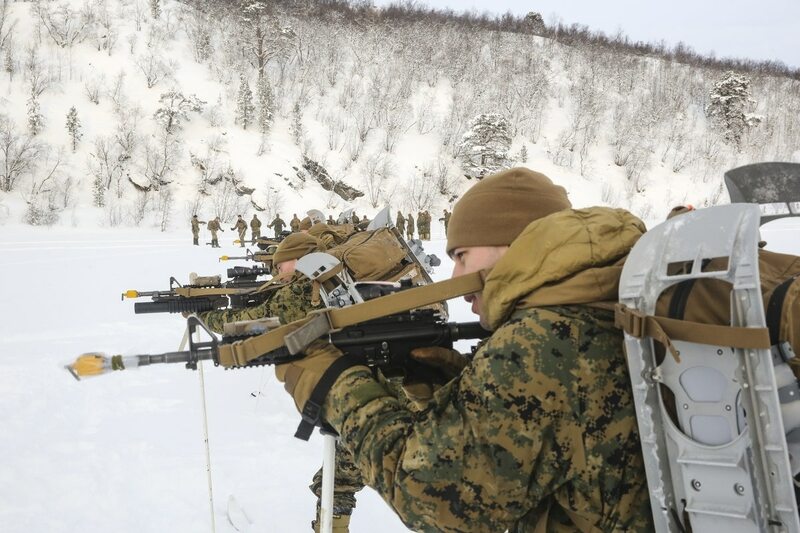 About 300 Marines are learning how to shoot and move in Norway's mountains. Equipment in the caves is often used for training missions in Europe, such as the most recent Saber Strike exercise in Latvia, which included Marine M1A1 Abrams tanks, LAV-25 light armored vehicles and M777 howitzers, Lazaroff told Marine Corps Times. But the question of how the Marines would get to and move their equipment in a fast breaking crisis ― such as a war with Russia ― remains, said Ian Brzezinski, who served as deputy assistant secretary of defense for Europe and NATO policy from 2001 to 2005. Russian submarines, aircraft and missiles could attack NATO military and merchant shipping in the North Atlantic and Baltic Sea, Brzezinski said. If the seas become hotly contested, another question is whether Sweden would allow the Marines to use its territory to move its equipment to the Baltic States.